ShoreMaster produces covers made from four specific types of marine-grade fabric. Each boat cover is custom-fitted and provides durability with a quality reinforced fit. By choosing a specific fabric based on the style of the boat and environment, boaters will ensure their water craft is safe from the elements. 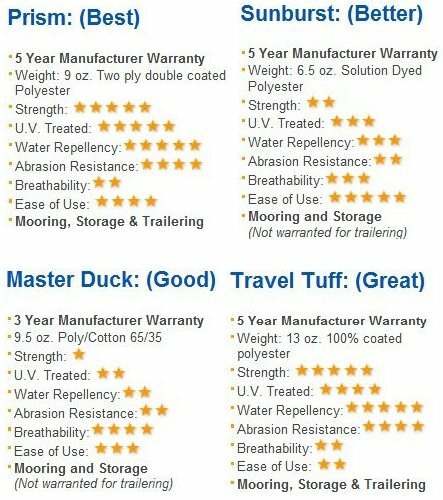 Travel Tuff, like all ShoreMaster fabrics, is exclusively made for boat covers. The fabric is made from heavy weight coated polyester, and can sustain the wear and tear associated with trailering. Additionally, Travel Tuff is also resistant to UV light and mildew, which makes it ideal for both indoor and outdoor use. Masterduck is made from a polyester cotton blend marine duck canvas. This material is mold and mildew resistant and offers some water repellency with high breathability, which makes it ideal for indoor storage. This is a boat cover that is stored under ideal conditions and the boat owner wants to keep the vessel clean and dust free. Prism is a premium fabric, which is offered in a wide variety of colors. This material is ideal for all climates, as it is made from two-ply double-coated polyester. It is built to withstand trailering and weather. Boaters, who plan on taking to the road while keeping their boat covered, will find this durable fabric useful. Sunburst fabric is made from 100 percent acrylic coated, solution dyed polyester. Sunburst is water-repellent, breathable, and most importantly, strong. This lighter weight fabric cover is appropriate for both indoor and outdoor usage, so boaters can use it when they’re underway and when their vessel is in storage. It’s important to choose the right boat cover fabric to protect your investment. Luckily, ShoreMaster is dependable and always hits the mark.